About a month ago I received an email from a California based green-tea company. In the letter I was very kindly asked if I would share my Matcha Biscotti recipe and photos for their monthly newsletter. Of course I said "heck yeah!" with Napoleonic (Dynamite) enthusiasm. First of all, I was just so happy to be asked (you'd be surprised at those who take without giving credit). Secondly, after reading the newsletter, I was so inspired by the other recipes I saw! If you'd like to see the newsletter, it is HERE. Check out the Matcha Rice Krispie Treats recipe. How cool is that? After receiving a very nice follow-up thank you letter, I received a sample of their baking grade Shiki Matcha. Uhmm, baking grade matcha? That exists? I can't say I'm the most educated person on green tea varieties, I just know that I like it. Upon reading their green tea guides, I feel more informed. What a great resource! 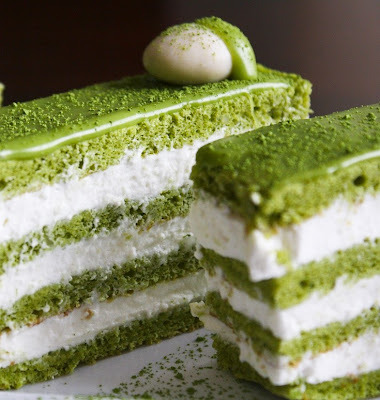 I've never seen such a beautiful color result when baking with Matcha. That's 100% natural green tea pigment! 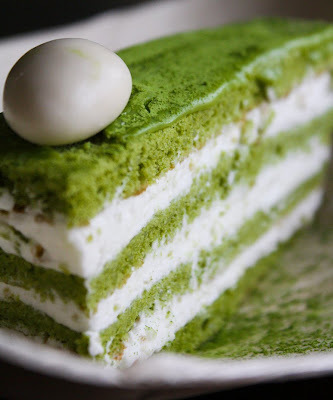 See Matcha-Almond Génoise Layer Cake on Key Ingredient. A good variation to this recipe would be to add 6 oz. of sweetened red beans to the whipped filling. You can find them, canned, at your local Asian grocery store. Not everyone likes red beans in a dessert (the hubs) so I left it out. I love them! I'm always the person at the end of a nice Teppanyaki dinner to order the red-bean ice cream. But of course, I love everything. That's part of my problem. I don't think they have 12-step programs for people who love everything. Do they? For a garnish, yogurt covered almonds pair well with the almond flavor in the cake. You could also use the chocolate-covered and candy-coated Jordan almonds. Apply them to the top of the cake before the ganache sets. I didn't do this, so I had to stick them on with some extra chocolate. ...at least I didn't do this! This cake is delicious. It is light, delicate, and the almond flour really gives the cake a great flavor. If you are one of those people who are wary about the bitterness of green-tea, let me tell you, this cake has none of that. The flavor is very mild, and the color is stunning! Special thanks to Maeda-en. If you are interested in reading up on green tea (health benefits, how it's made, etc.) I'd suggest reading the Green Tea 101 provided on their website. Wow, this is truly beautiful! Thank you for posting such an awesome post. Do you mind if I added this post on next week's Friday link round up? Absolutely gorgeous! I've never tried Matcha - can you believe that? OMG, this looks sooo delicious! I might just be making this (or some of your other green tea treats) for an upcoming Chinese New Year party next weekend! Wow, you are an awesome baker. Thanks for sharing!! That's such a gorgeous cake! Stunning color and I bet the flavor wasn't far behind! Omg, wows!! This looks gorgeous. It's my first time to your blog and I have to say you're really an impressive baker! :D Adding your site to my favourites! So stunning! The color is spectacular, especially since it's natural! Maybe for St. Patty's Day? I LOVE almond and this sounds delicious! I made a salad with green tea noodles this week, but sadly they did not retain such a gorgeous green. Love your blog!! I'm your new follower!! Come check me out when you have time. That cake is out of this world gorgeous with that color... perfect presentation... I love your blog!! Seriously stunning cake. Looks like a work of art. This is an awesome post! The cake looks so good, and i can't believe that the green is the real color of the tea. The first thing I did was scan for food coloring, but didn't find it. Nice! So pretty! I adore matcha and had no idea there was a baking grade! So nice! I love green anything and this looks so unique! Great blog. 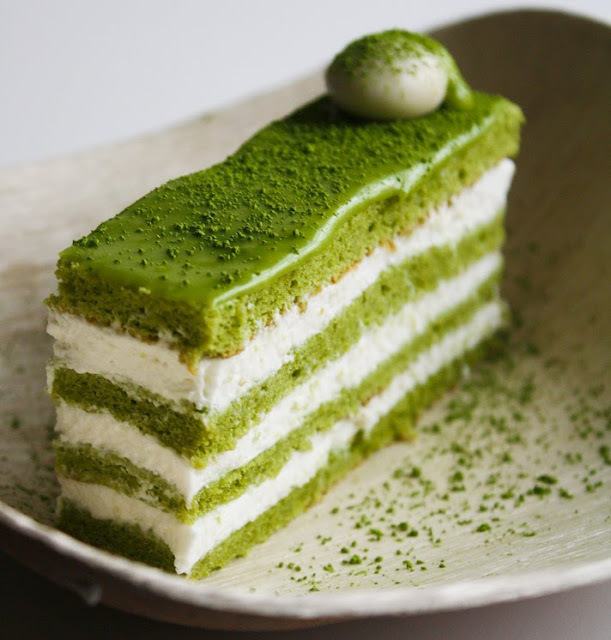 What a beautiful cake- I'm always looking for new ways to use matcha. It's so good to drink just on its own, but when you start adding sugar and butter to the mix...heavenly! This is absolutely beautiful. I think I might just look at it instead of eating what. 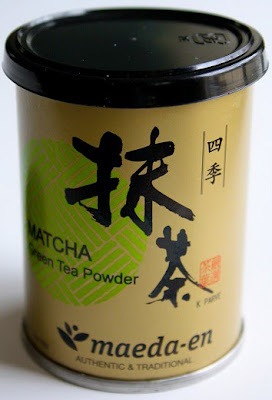 I love green tea and I have the powder to make my own green tea frapps at home but I have never baked with it. I am going to have to try now!! ooh wow this is beautiful your layers are so perfect! just found your blog, looks so amazing! I want to try! 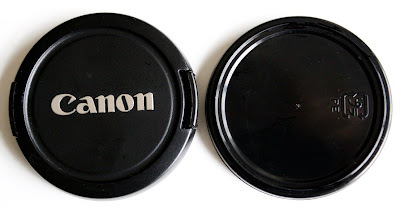 I am lol about the lid! Hello! I just found your blog and I must say that I adore it! Your treats look divine! This is my 1st time reading your blog and it's fantastic! I've not had green tea in dessert form. Your cake sounds interesting and looks gorgeous! You know I haven't had sweet red bean anything either. I'm deprived. Thanks for this read. Well, this is my first visit to your blog! But I admire the precious time and effort you put into it, especially into interesting articles you share here! 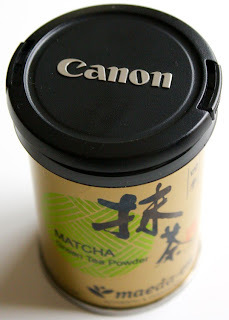 I absolutely adore anything Matcha related. It's just the taste of that tea. Not that I would drink it by itself,however,as a desert is perfect! Not so suffocatingly sweetening like most,it has a hint of bitterness that relates me to the tea. I'm trying to make this recipe, but I'm running into some issues. First, it took almost 20 minutes to bake the cake... I know the recipe says 5-8, but after 5 minutes, it was barely set, and after 10, the texture was just starting to kind of resemble that which I seen in your pictures. I know different ovens have different baking times, but 4 times as long? Do you have any suggestions or tips, something I might have done wrong? Second, the cream is really having trouble supporting the cake, so you have any suggestions for making it stiffer? 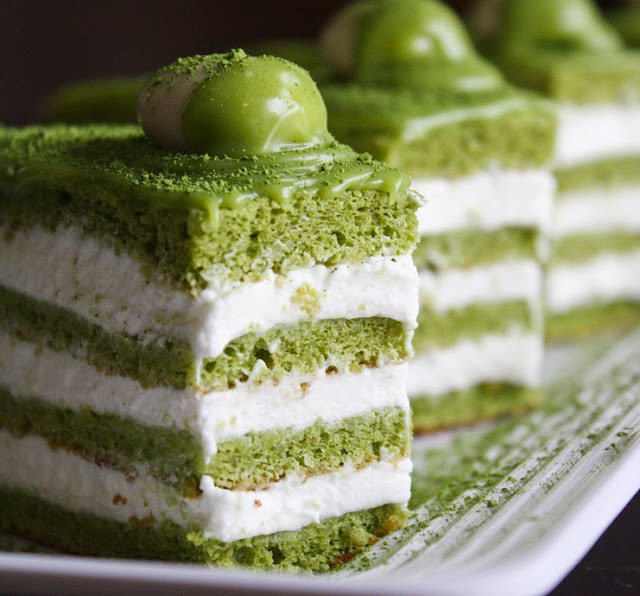 Hello, I wanted to ask how do you remove the brown top of the matcha cake? I've always had that problem when baking it. Absolutely beautiful. I plan on making this for the boyfriend's sister who just got promoted but I'm worried about transporting the cake. Should I cut it at the arrived destination or should I cut into fingers and then do the transport? One of the most gorgeous desserts I have ever come across! I absolutely adore anything Matcha related. And the colors here are great. Hi Heather - just wanted to mention I made this cake twice. First time, the cake was extremely thin so I ended up stacking and stacking to make something like a 15-layer torte out of it (the pieces were still very small). That said, it was ultra delicious. For Father's Day, my husband actually requested it again...so I made it again and baked the cake in a 9x13 pan instead of a sheet pan. It gave me a thicker cake that was much easier for me to work with. I layered the cake with cocoa cream. So very delicious! Thank you! Hey ! Is it possible to substitue the almond flour for all purpose flour ? My bf has a nut allergy and I'd like to cook something like this for him ! I searched on google and found the recipe at "theteacupoflife.com" Made it last night and made two batches of the genoise and baked it in a 9 inch round. The cake was fantastic and I made the second batch with vanilla bean and left out the green tea. Baked it for about 14 minutes and the trick is to not over-bake it. As soon as it cools for a minute the cake pulls away from the pan and easily pops out. The only thing I found was it was a bit too sweet. Thinking to reduce the sugar in the whipped cream or less of the chocolate ganache. Very easy baking. Takes no time at all and fantastic genoise recipe that I will be using again! We had this after a Ramen dinner. lovely!